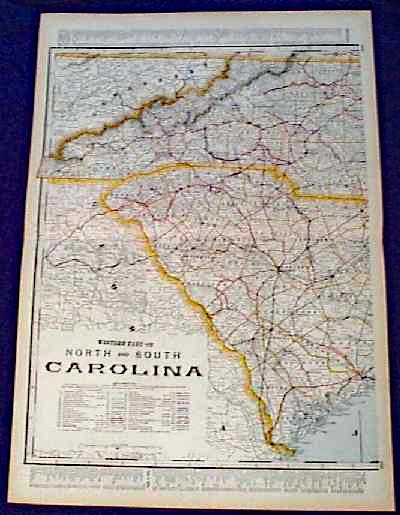 North Carolina Prints and Maps. 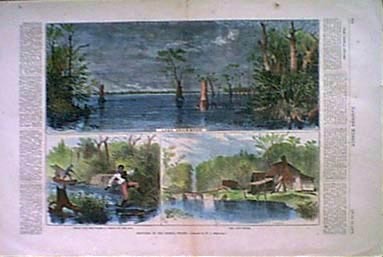 1873 North Carolina 'Sketches in The Dismal Swamp.' 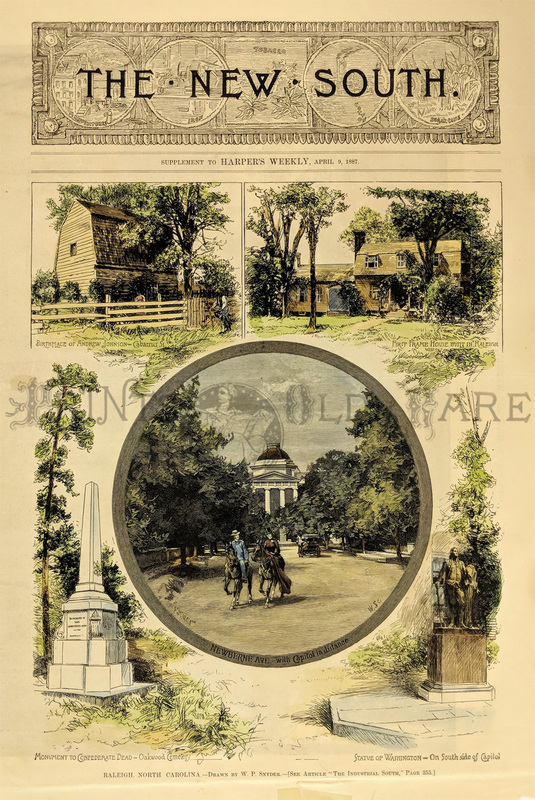 Three authentic hand-watercolored antique engravings on one page, plus descriptive text from original Harper's Weekly published in 1873. Lake Drummond; Going into the Swamp-A check on the Tow; and The Lone House. Genuine antique produced in 1873 - NOT a reproduction! 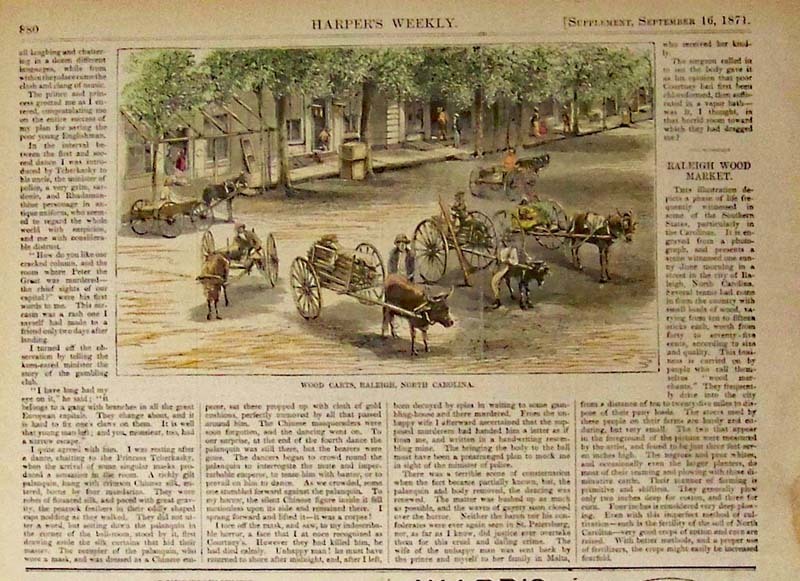 1871 Wood Carts, Raleigh, North Carolina. Hand colored wood engraving from Harper's Weekly. 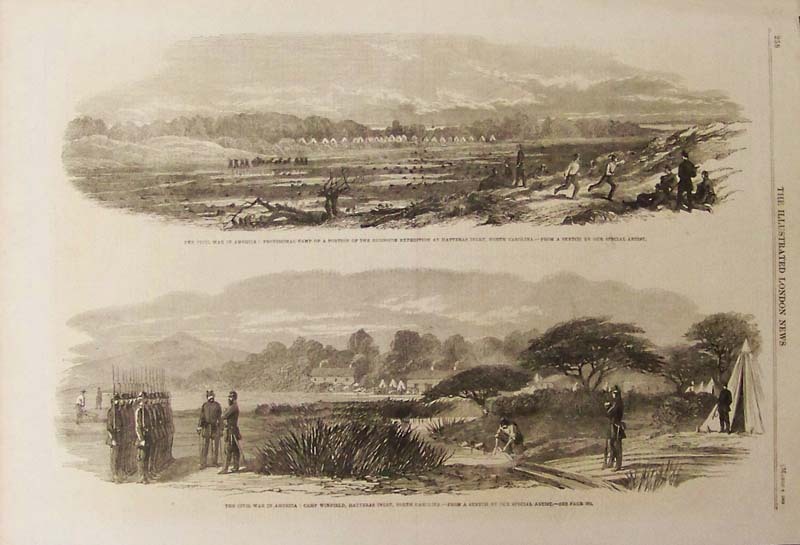 1862 The Civil War in America - General Burnside's Expedition: The 9th New York (Hawkin's Zouaves) and the 21st Massachusetts Taking the Confederate Fieldwork on Roanoke Island at the Point of the Bayonet. 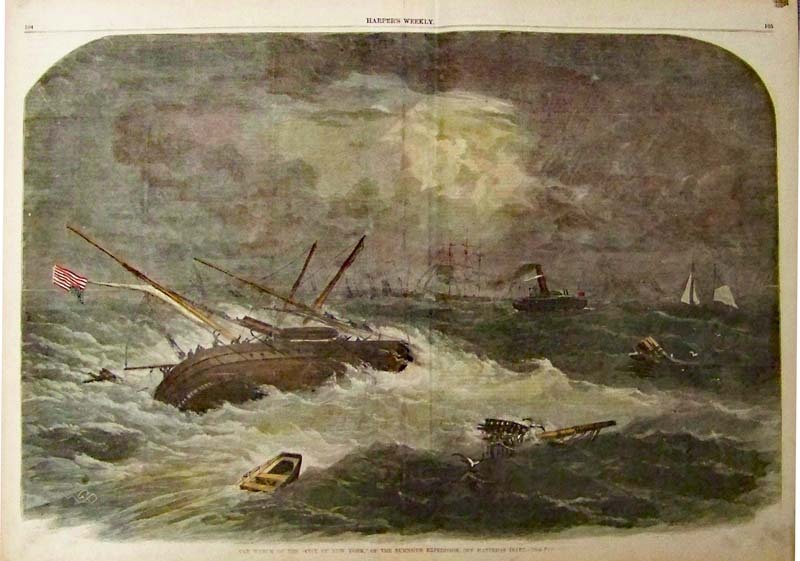 Wood engraving featured in The Illustrated London News. A Detachment of U.S. 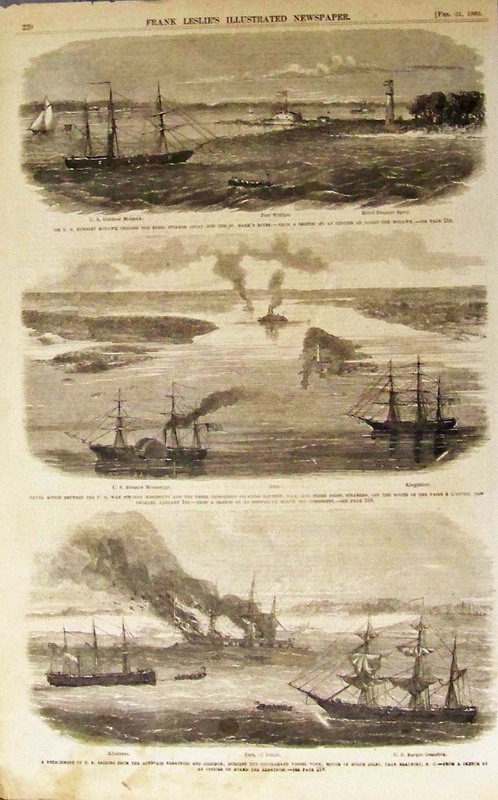 Sailors from the Gunboats Albatross and Gemsbok, Burning the Contraband Vessel York, Mouth of Bogue Inlet, Near Beaufort, N.C. Wood engravings featured in Frank Leslie's Illustrated Newspaper. 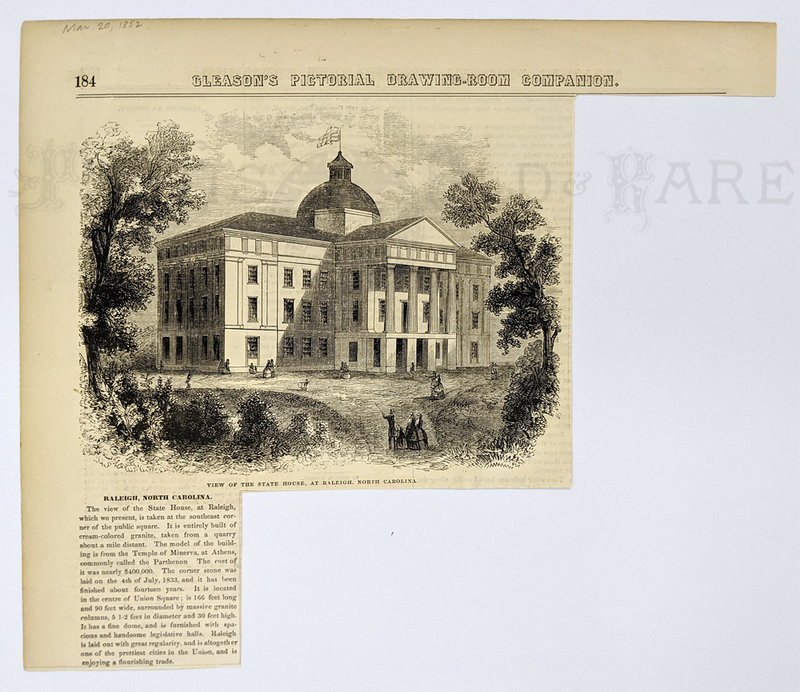 North Carolina,-- the Forthcoming Exposition of State Industries and Resources -- The Exposition Building at Raleigh. 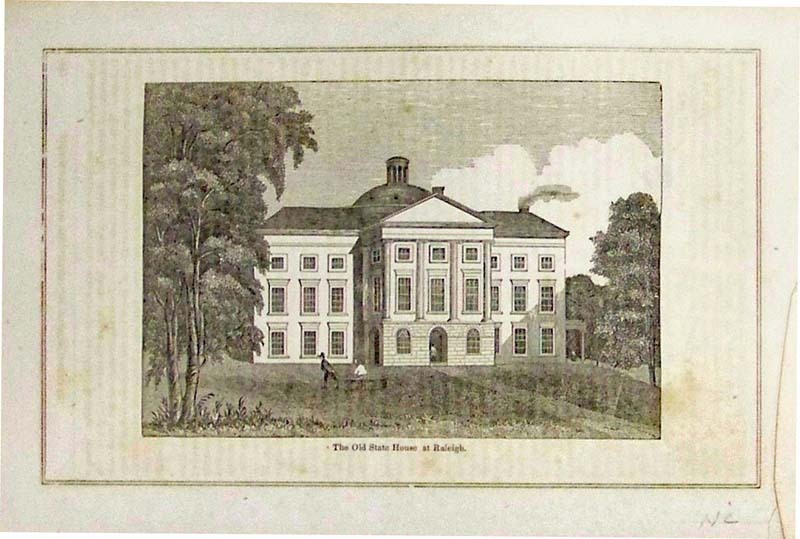 Frank Leslie's Illustrated Newspaper wood engravings. 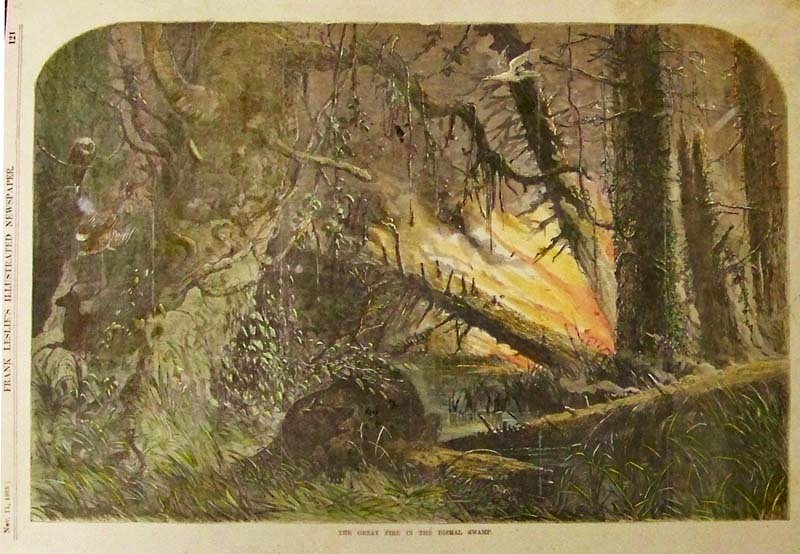 1865 The Great Fire in the Dismal Swamp. 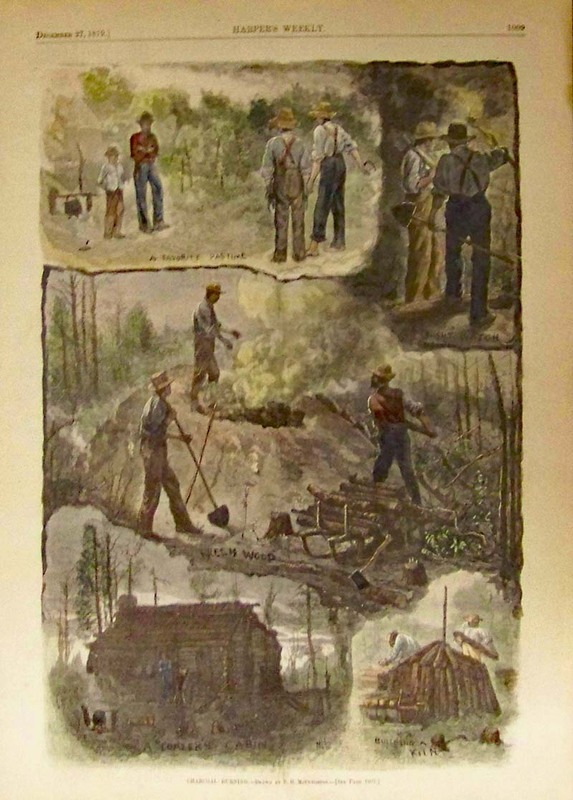 Hand colored wood engraving from Frank Leslie's Illustrated Newspaper. 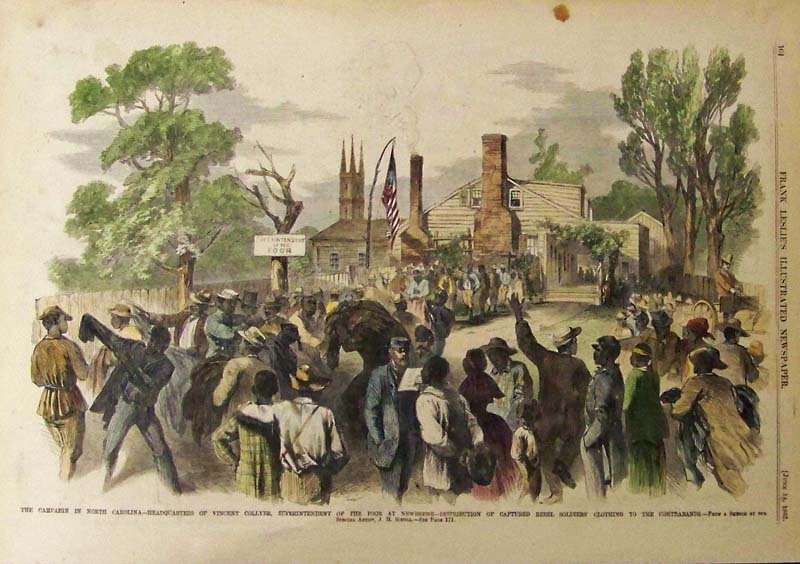 1862 The Campaign in North Carolina -- Headquarters of Vincent Collyer, Superintendent of the Poor at Newberne -- Distribution of Captured Rebel Soldiers' Clothing to the Contrabands. 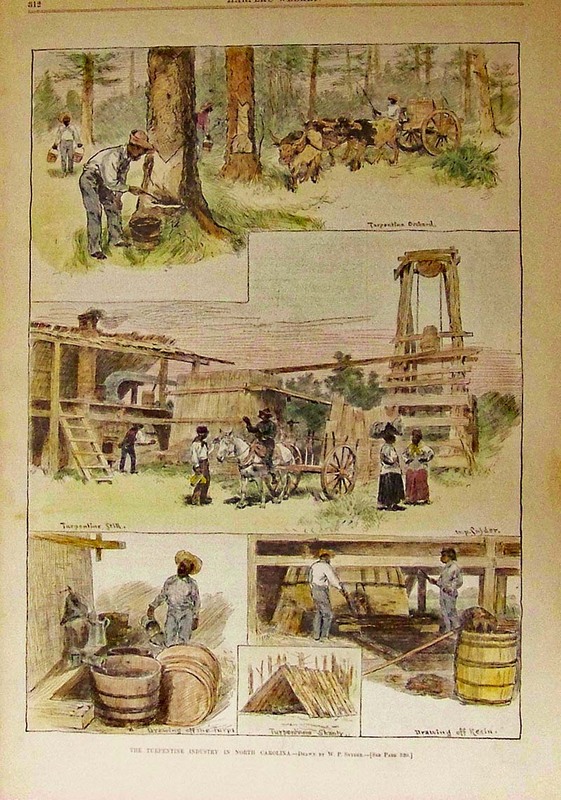 Hand colored wood engraving featured in Frank Leslie's Illustrated Newspaper. 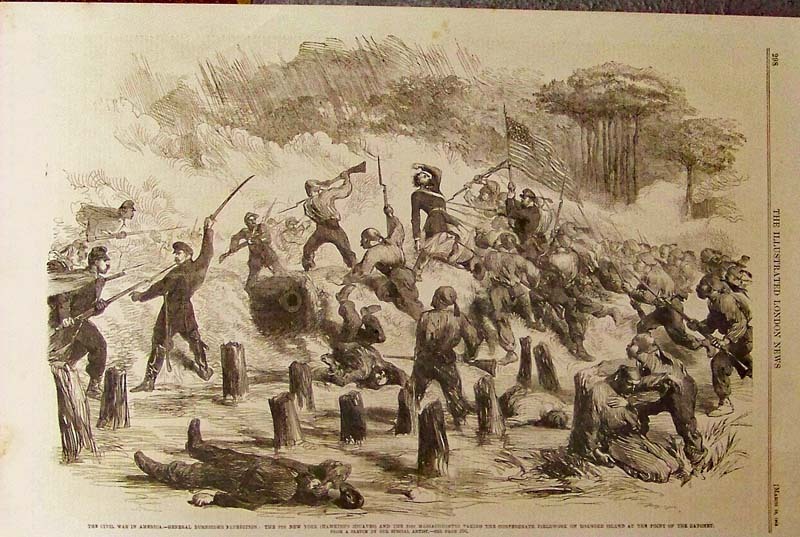 1862 The Civil War in America: Camp Winfield, Hatteras Inlet, North Carolina. 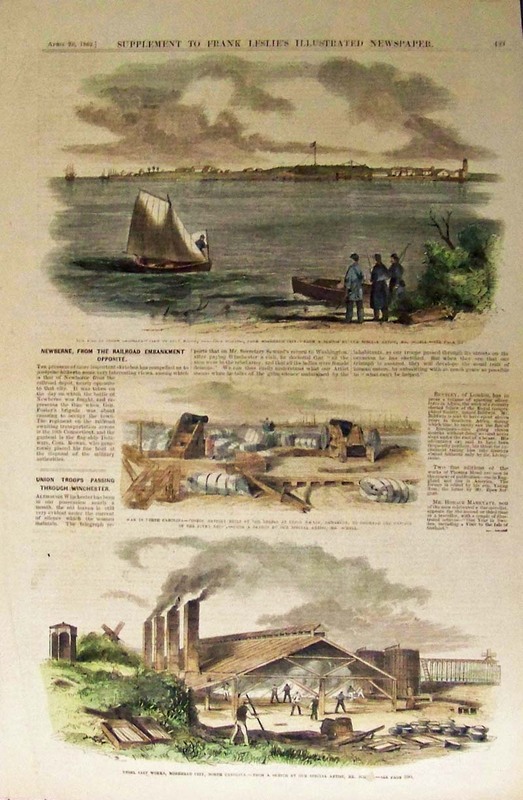 Wood engraving featured in The Illustrated London News. The New South -- Scenes in North Carolina, Georgia and Florida. 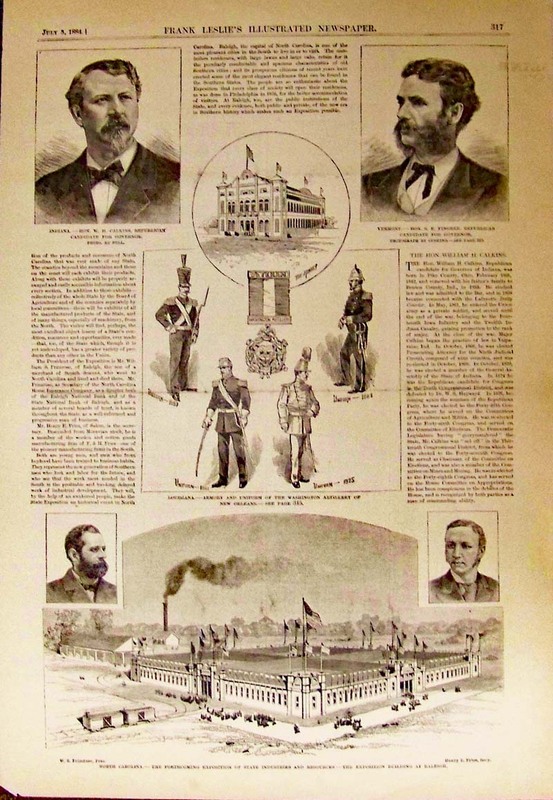 1883 Frank Leslie's Illustrated Newspaper. Hand colored, wood engraving. 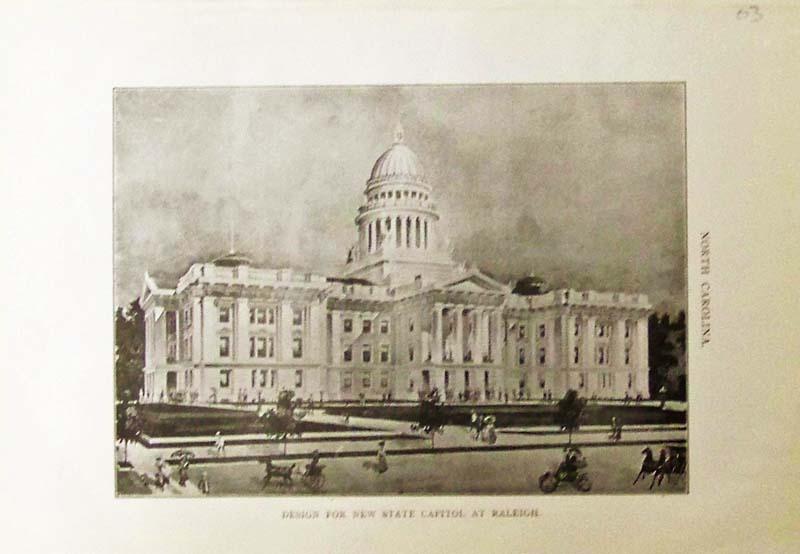 1903 Design for New State Capitol at Raleigh - Half-tone image of the State Capitol in Raleigh, North Carolina. 1877 State-House at Raleigh, North Carolina. 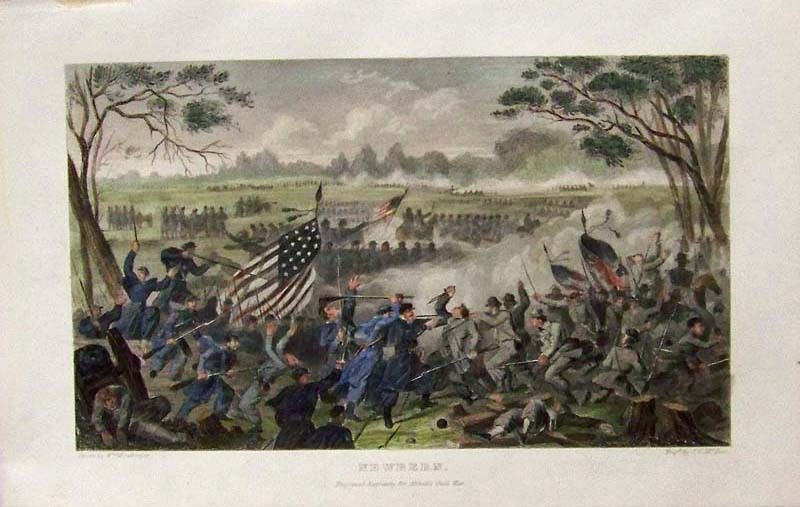 Hand colored wood engraving featured in the History of the United States. 1850 The Old State House at Raleigh. Wood engraved view. 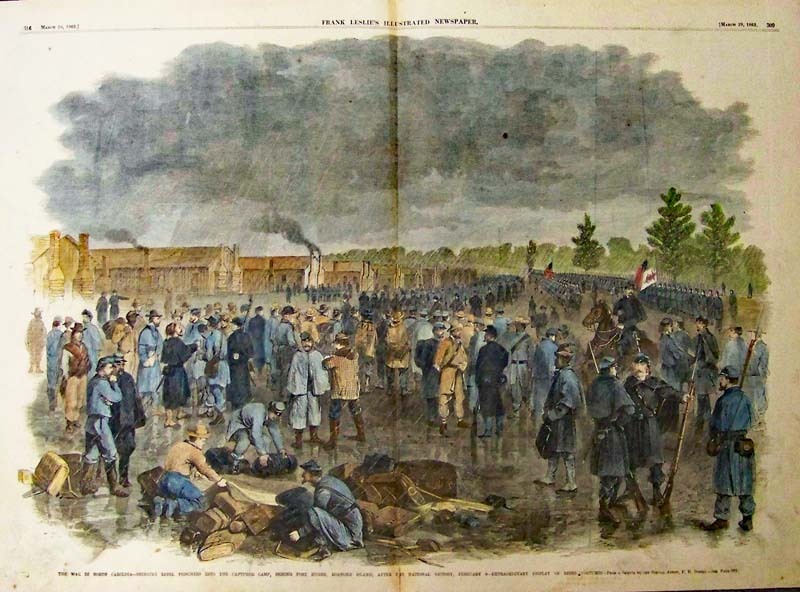 1862 The War in North Carolina -- Bringing Rebel Prisoners into the Captured Camp, Behind Fort Huger, Roanoke Island, after the National Victory, February 8 -- Extraordinary Display of Rebel Costumes. 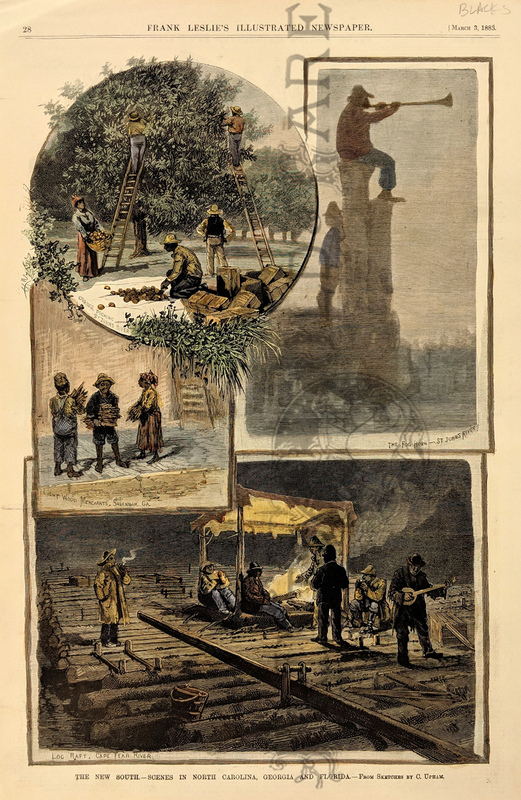 Hand colored wood engraving featured in Frank Leslie's Illustrated Newspaper. 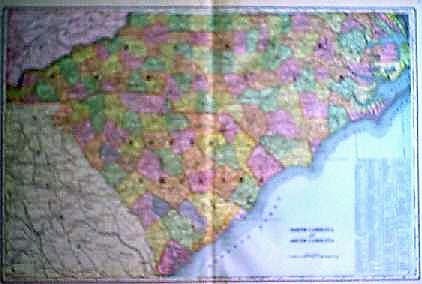 1901 Color Map of Carolinas. 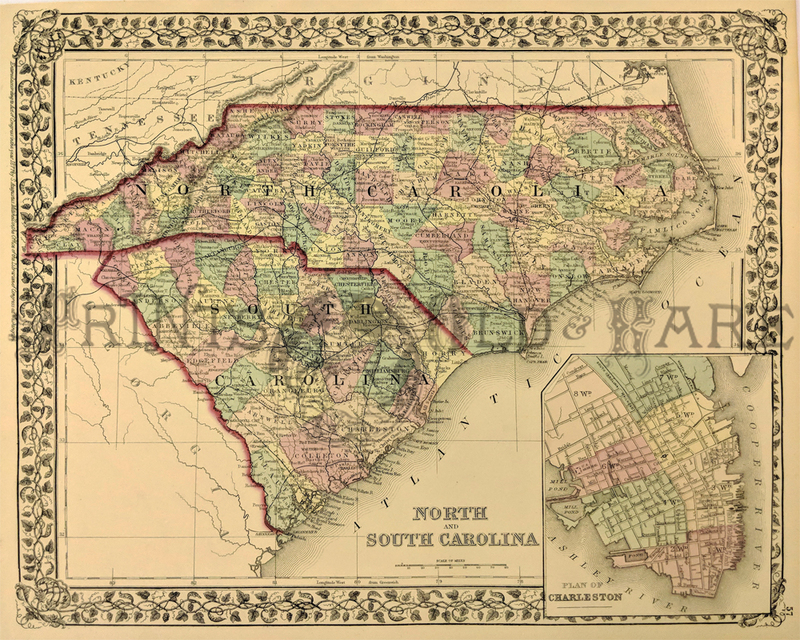 Old color engraving of North and South Carolina, with counties by original color. Key with county and city locations. Very nice. 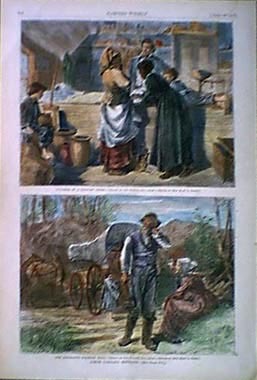 Four hand colored engravings from the February 15, 1862 issue of Harper's Weekly. 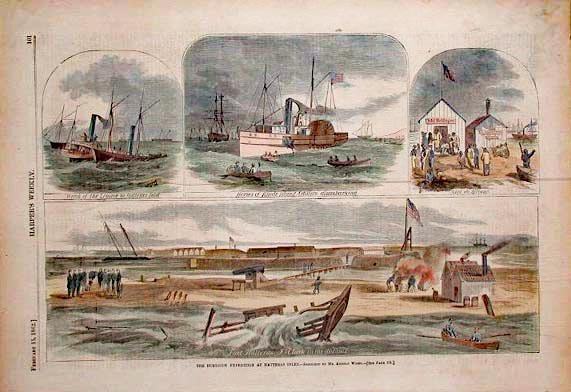 The Burnside Expedition at Hatteras Inlet. Larger image on bottom shows, Fort Halleras - Fort Clark in the distance. 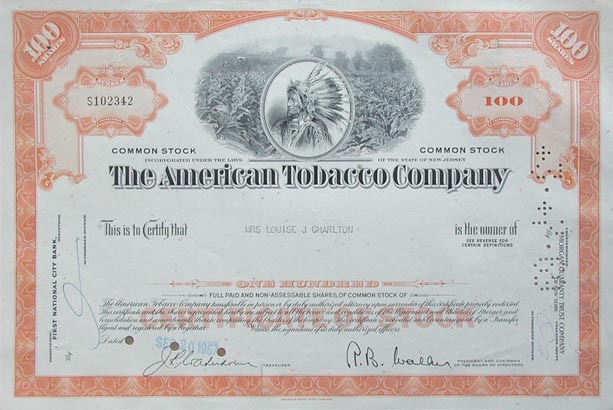 The American Tobacco Company Stock. 100 shares of Common Stock Certificate dated September 20, 1967. Cashed March 3, 1969. Very decorative, with a portrait of an Indian over a view of a tobacco field in the top center. 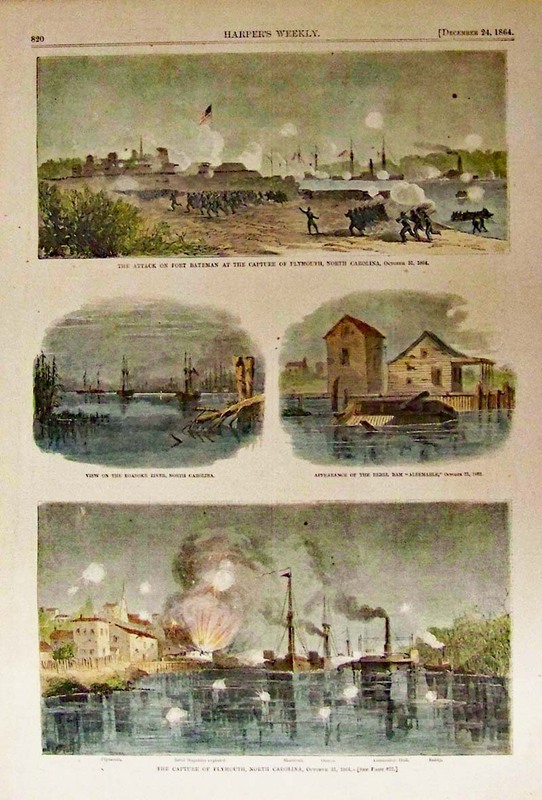 Hand colored wood engravings from the June 14, 1873 issue of Harper's Weekly. 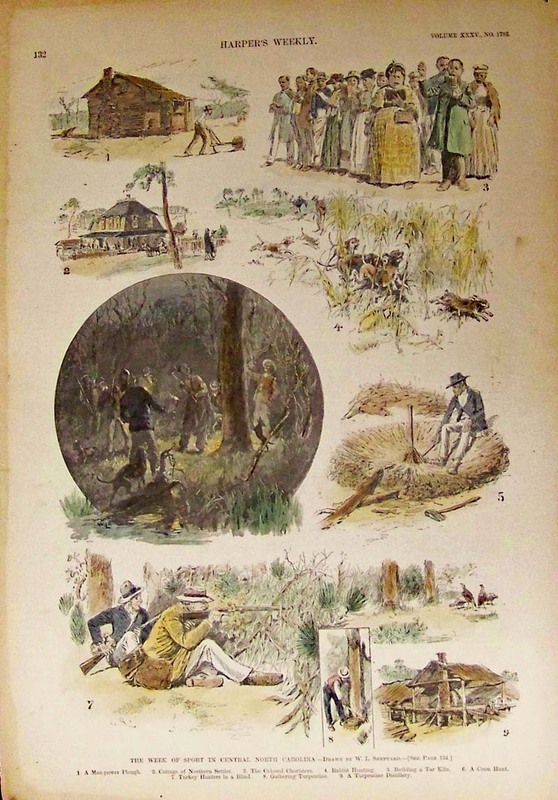 Larger image on top of page is titled, Timber Cutters Going into the Swamp. 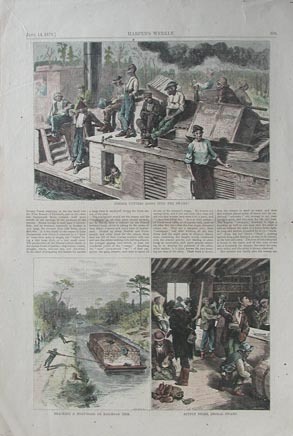 Two images on lower part of page titled, Tracking a Boat-Load of Railroad Ties. and Supply Store, Dismal Swamp. 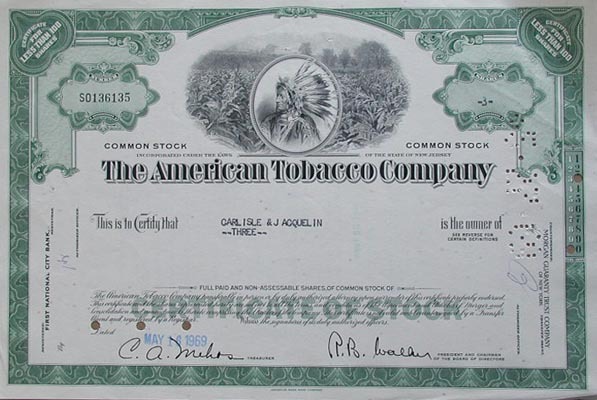 The American Tobacco Company Stock. 3 shares of Common Stock from 1969. Very decorative, with a portrait of an Indian over a view of a tobacco field in the top center. 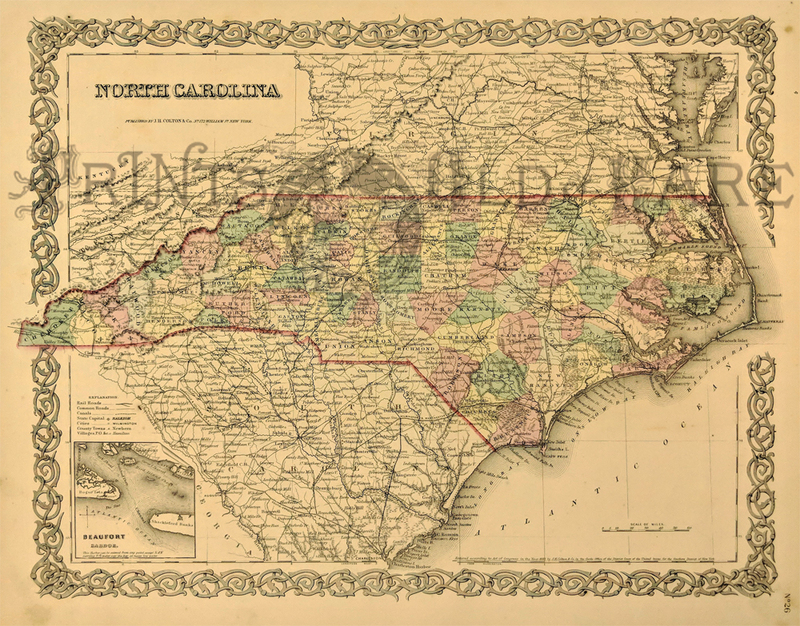 1927 Color North Carolina map which also has an inset of the Western Part of South Carolina. Published by C.S. 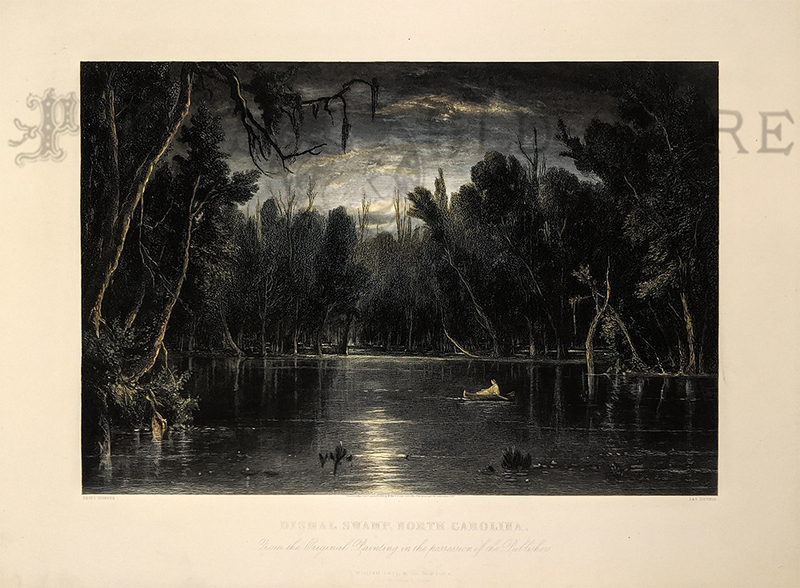 Hammond & Co., N.Y.
1851 Hand colored lithographed U.S. Coast Survey by A.D. Bache, Reconnaissance of New River and Bar, North Carolina, by the Party under the Command of Lieut. J.N. Maffitt, U.S. Navy Asst. U.S.C.G. There's a Notes and Tides guide bottom left side. on bottom right of map. 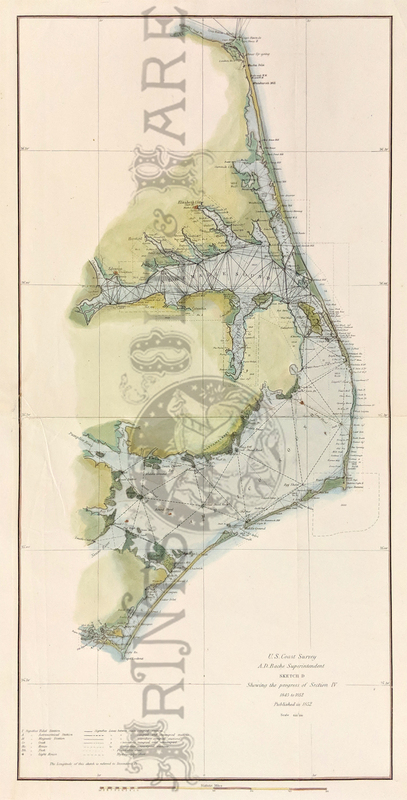 Sketch of Ocracoke Inlet, North Carolina. 1852 U.S. Coast Survey. 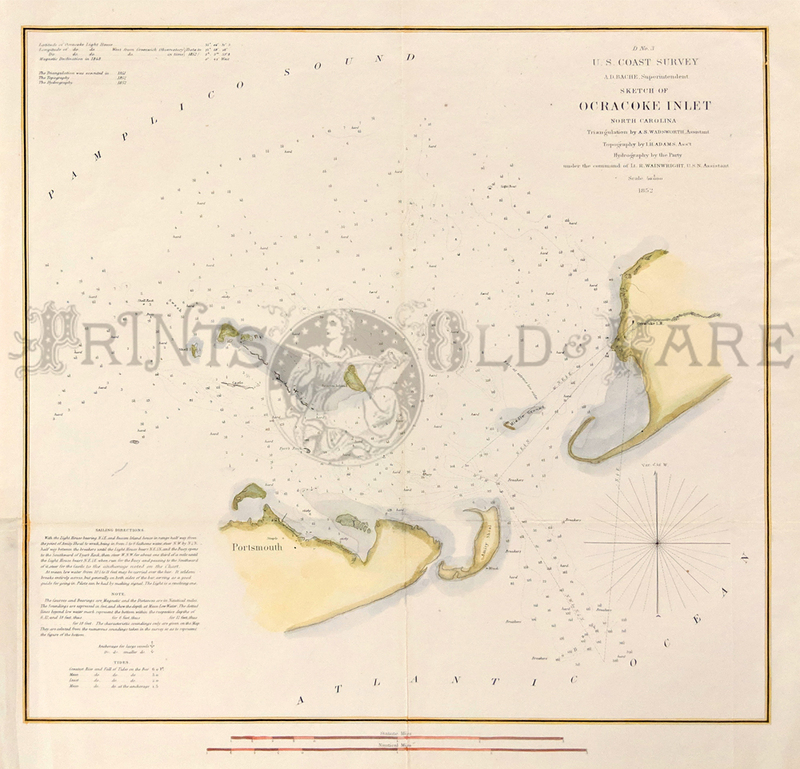 Portsmouth, Beacon Island, Amityu Shoal, Ocracoke areas are shown. Soundings, shoals, points, rivers, buoys, light houses and place names are also detailed. Bottom left quadrant shows extensive notes on tides and sailing directions. Hand colored, lithograph. 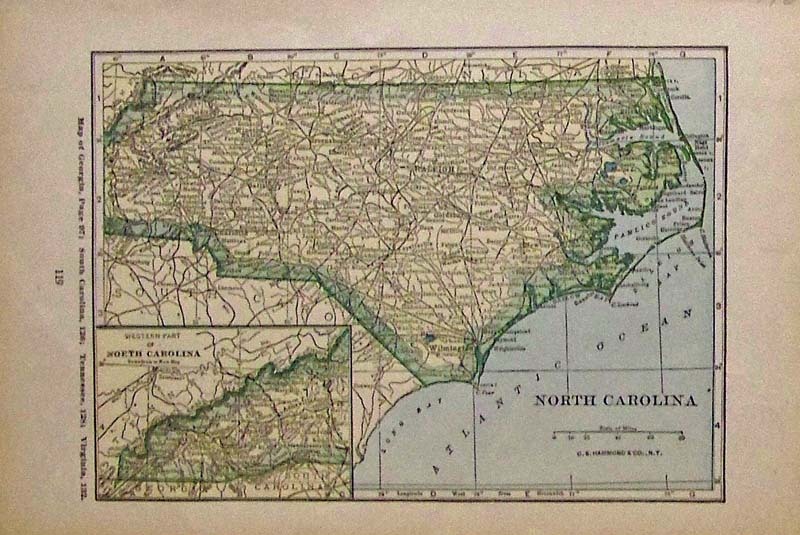 Map of North Carolina by Gray's Atlas. 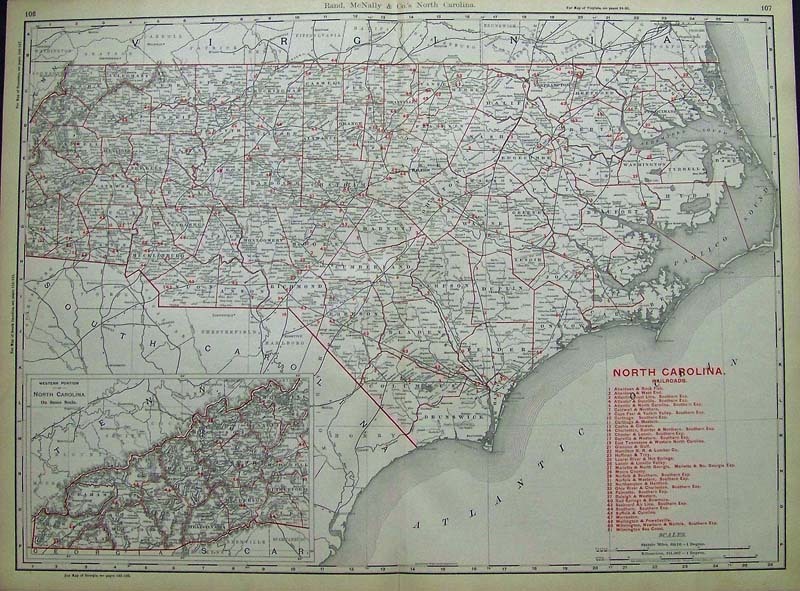 Detailed map showing Railroads, Roads, Cities, Counties, and Villages. Inset depicts Beaufort Harbor. 1875. Hand colored, Lithograph. 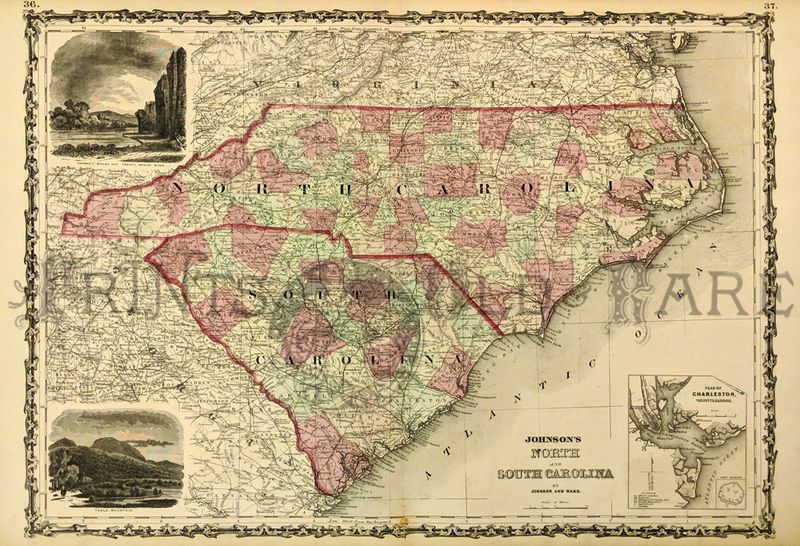 Johnson's 1861 Map of North and South Carolina. Showing the counties, towns, railroads, lakes, rivers, forts, swamps and islands. 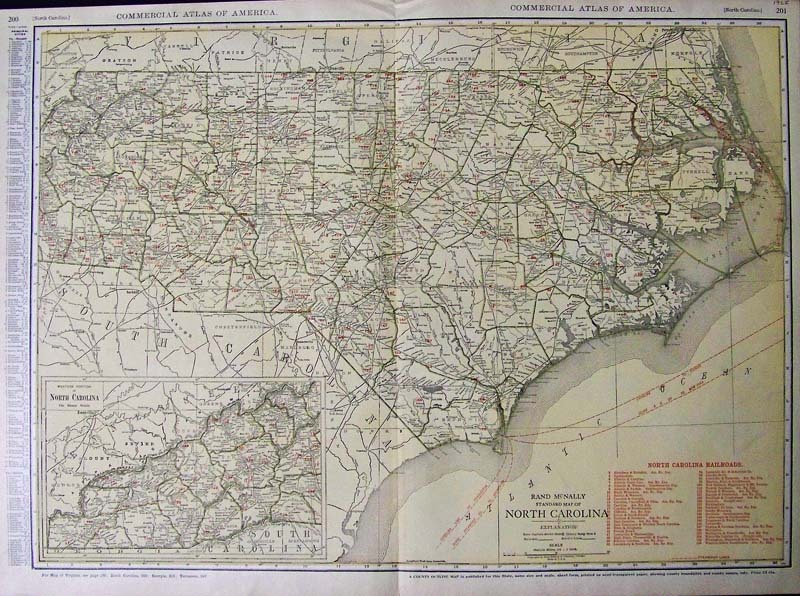 Inset plan of Charleston and Fort Sumter and large vignettes of Table Mountain and Chimney Rocks and French Broad River. Preliminary Chart of the Sea Coast of North Carolina from Cape Hatteras to Ocracoke Inlet. 1852 U.S. Coast Survey. Portsmouth, Beacon Island, Cape Hatteras, Hatteras Inlet are shown. Notes on tide and lighthouses are detailed. Hand colored, lithograph. 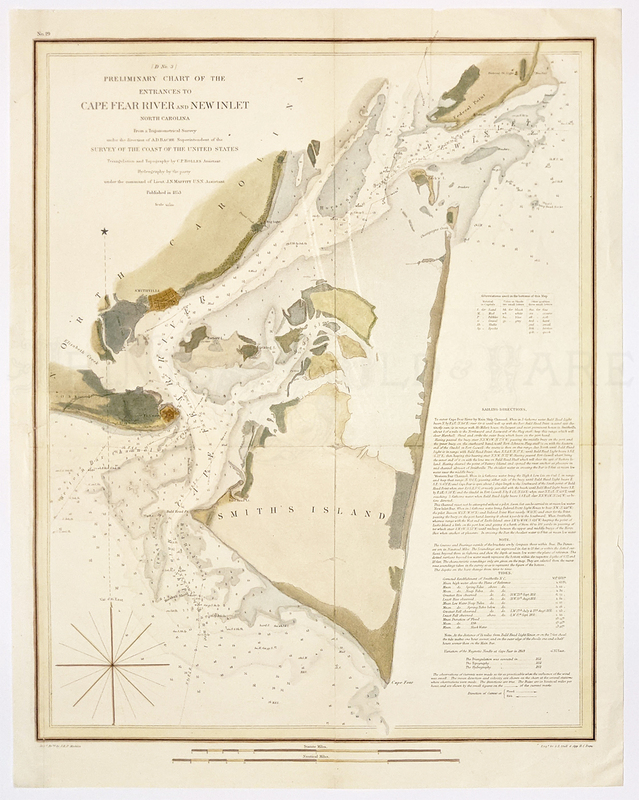 Preliminary Chart of Hatteras Inlet, North Carolina. 1862 U.S. Coast Survey. 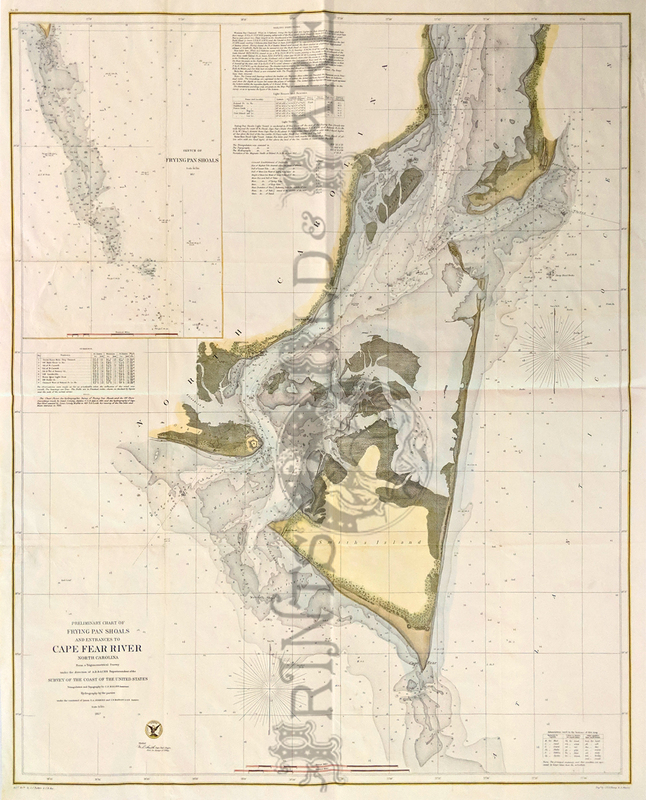 Highly detailed chart of Hatteras Inlet with Fort Clark and Fort Hatteras highlighted. Notes on the Soundings and Tides are detailed lower right quadrant. Hand colored, lithograph. 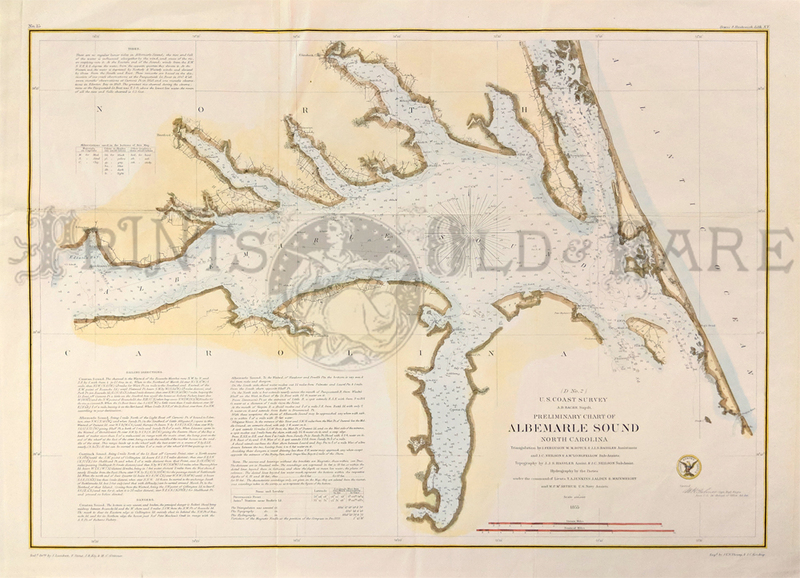 Preliminary Chart of Albemarle Sound, North Carolina. 1855 U.S. Coast Survey. Showing soundings, shoals, points, rivers, buoys, lighthouses, place names. Detailed notes on sailing directions, dangers, and tides. Hand colored, lithograph. 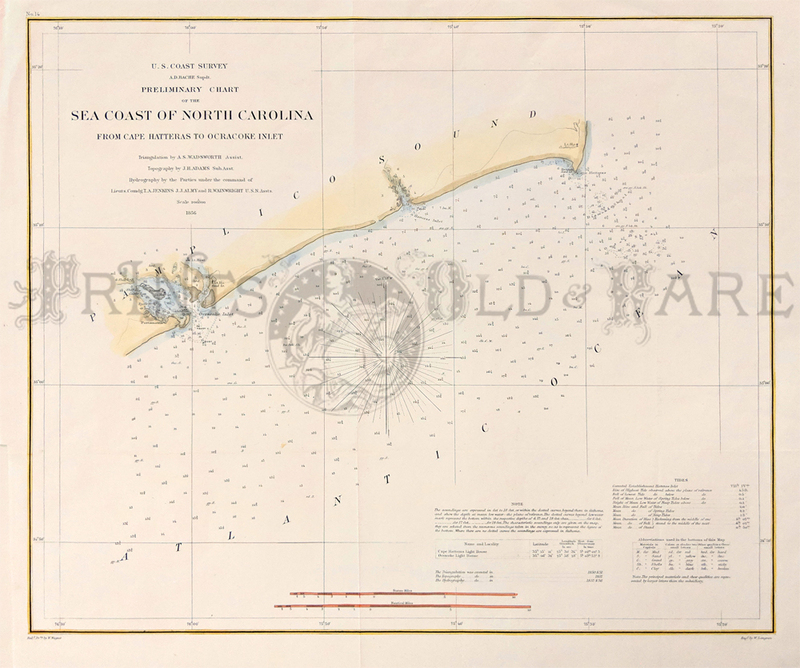 Preliminary Chart of Frying Pan Shoals and Entrances to Cape Fear River, North Carolina. 1857 U.S. Coast Survey. Beautiful large chart map showing the shoals, points, rivers, buoys, lighthouses and place names. 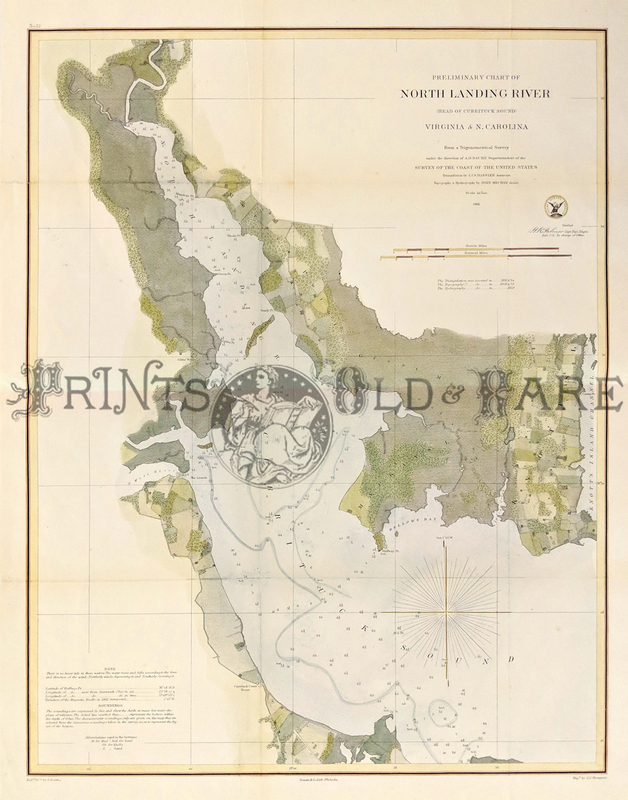 Smiths, Oak, Marsh, and Federal Point Islands are also shown. Inset of Frying Pan Shoals upper left quadrant. Detailed notes on sailing directions, light houses and beacons, light vessels, and tides. Hand colored, lithograph. 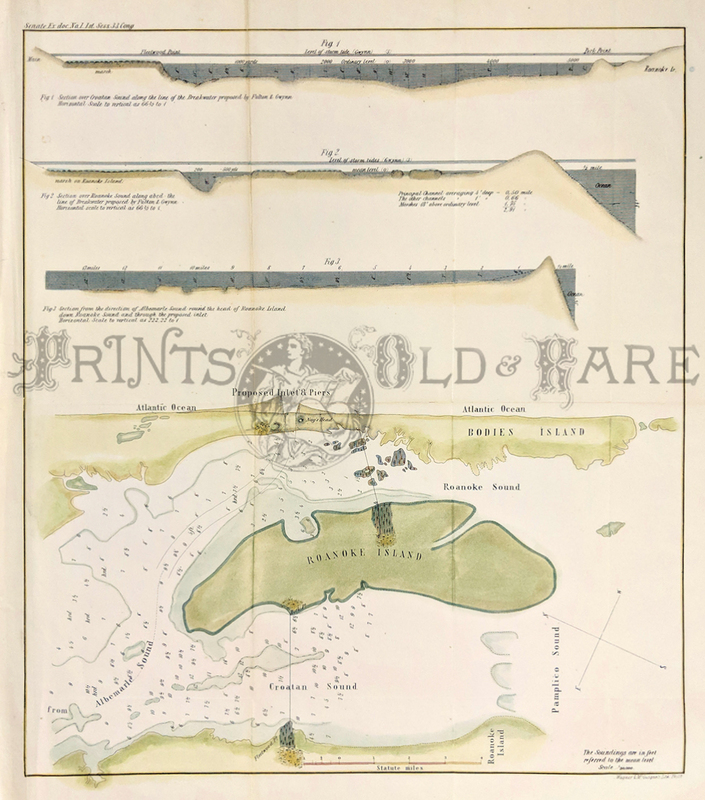 Rare Senate Chart map of Roanoke Island. Upper half showing 3 figures of the depth sounds at Croatan Sound, Roanoke Sound, and Albemarle Sound. Nag’s Head, Bodies and Roanoke Islands are also shown. Hand colored, lithograph. 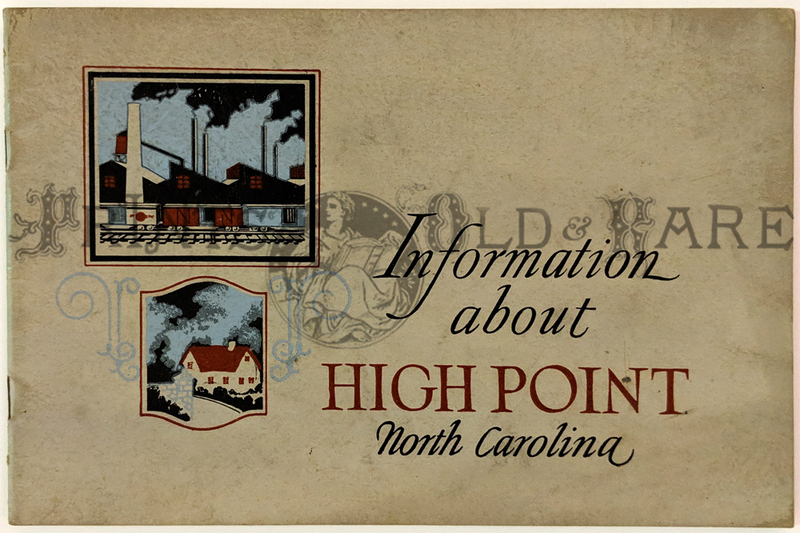 High Point c.1920s. Chamber of Commerce publication. 28pp of photos and facts highlighting businesses, amenities, opportunities, financial and industrial development. Raleigh 1887. Picture of Capital surrounded by 4 vignettes. Hand colored, wood engraving. 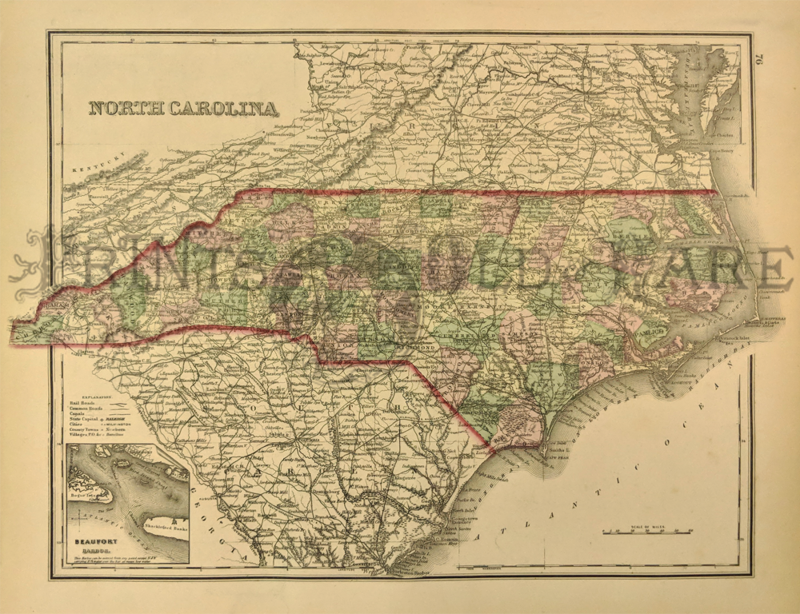 1877 Map of North & South Carolina by Mitchell. Shows names of counties, cities, towns, transportation routes, rivers, lakes, and mountain ranges. Regions are distinguished by color. 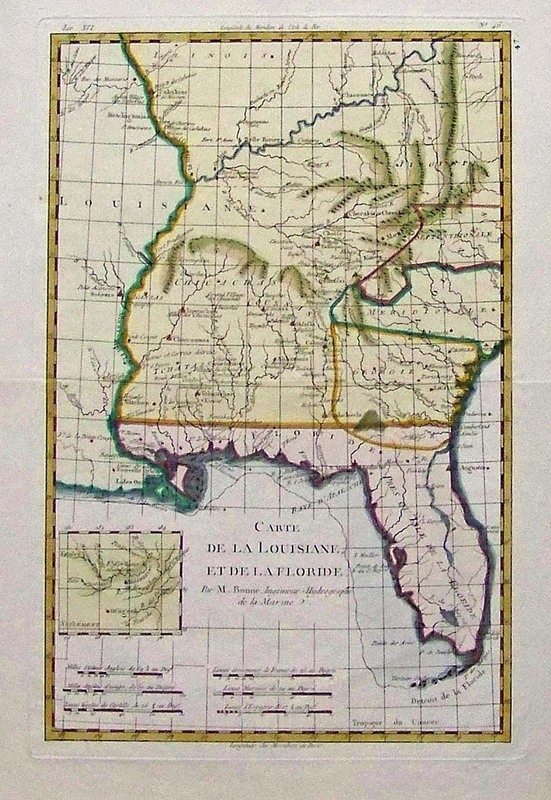 Inset showing the Plan of Charleston. Hand colored, steel engraving. Charlotte. 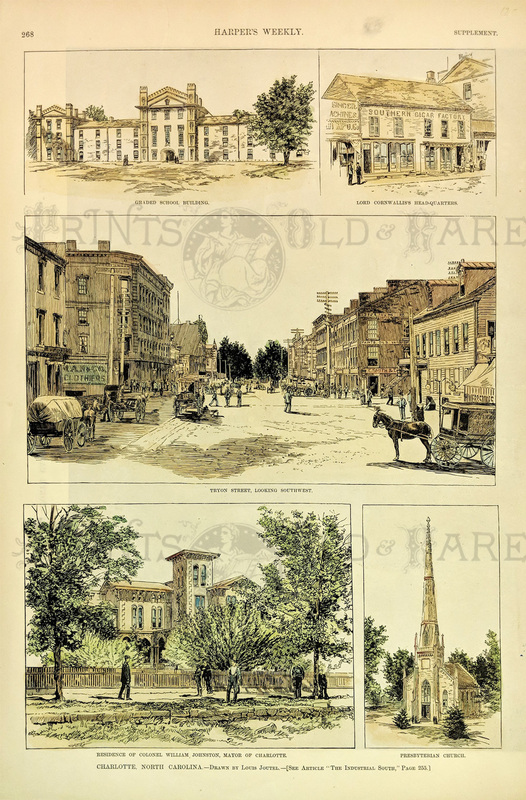 5 Rare views from 1886. 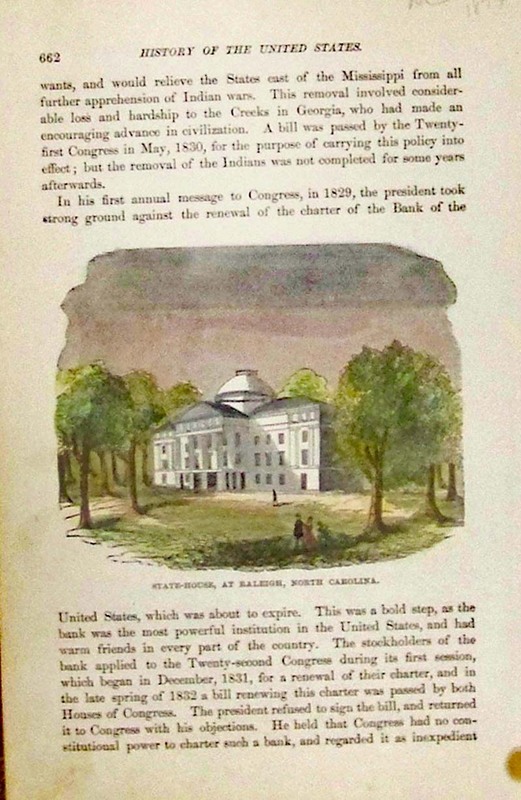 Includes Tryon St. and Cornwallis Headquarters and other prominent buildings. Water color, wood engraving. 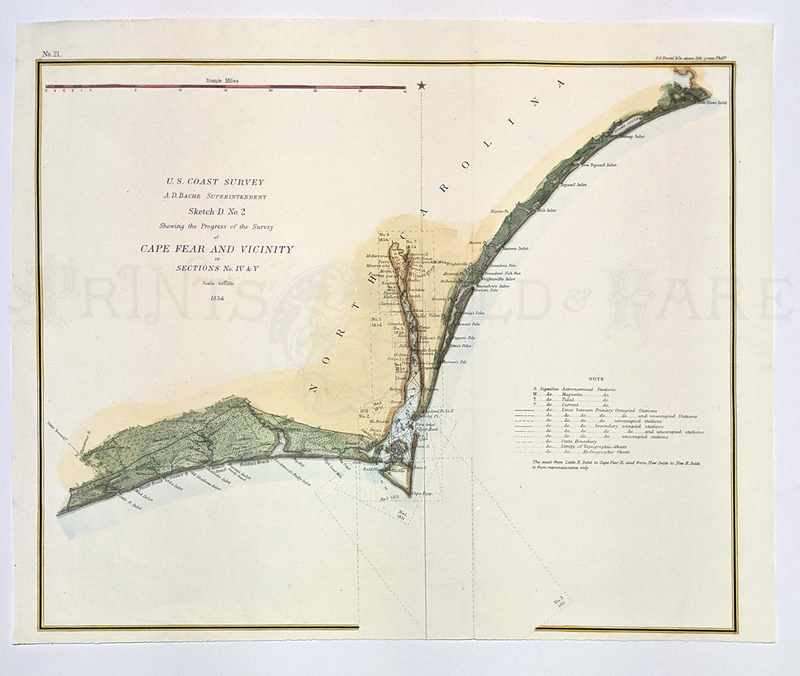 1854 Hand colored lithograph U.S. Coast Survey, A.D. Bache, Superintendent, Sketch D, No. 2 shower Cape Fear and Vicinity and Outer Banks of North Carolina in Sections No. IV & V.
1852 Hand colored lithograph U.S. Coast Survey -- A.D. Bache, Superintendent, Sketch D, Showing the progress of Section IV from 1843 to 1852. 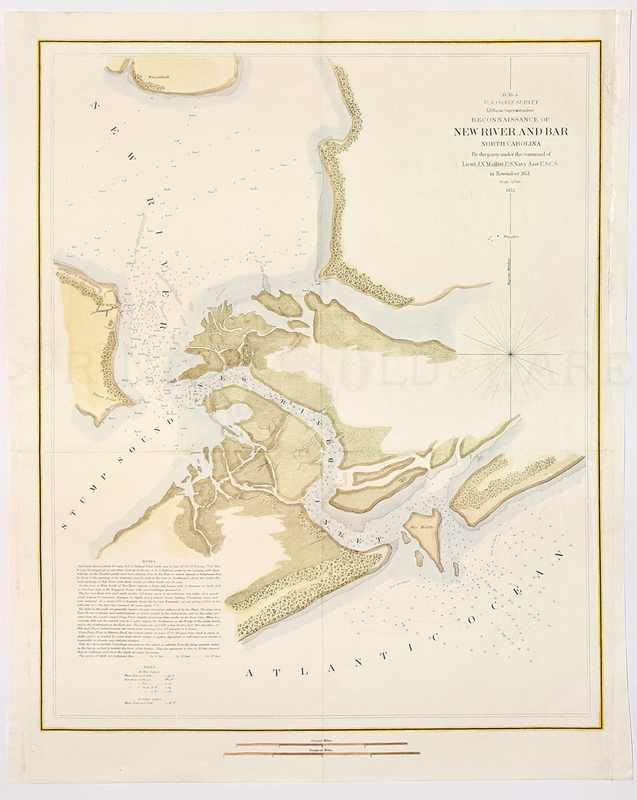 Shown are the Albemarle Sound and the Pamplico Sound. 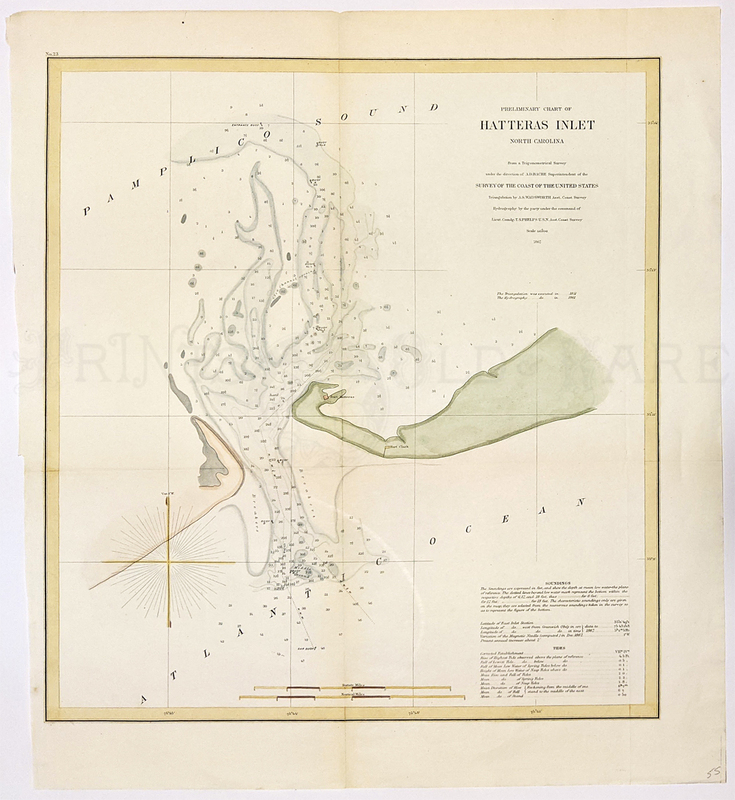 Preliminary Chart of North Landing River (Head of Currituck Sound) – Virginia & N. Carolina. 1861 U.S. Coast Survey. Showing extensive inland details; fields, buildings and points. Sounding notes in the lower left quadrant. Hand colored, lithograph.